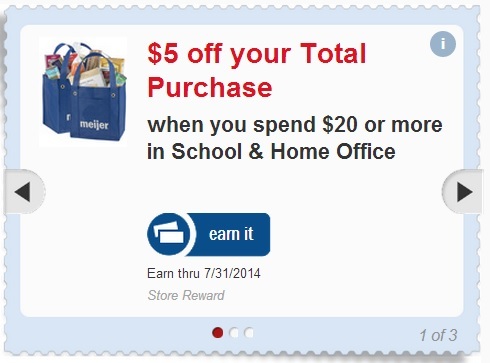 Meijer – Earn $5 on a $20 School or Home Office Supplies Purchase! There is an mperk reward available where can you earn $5 back when you purchase $20 worth of school or home office supplies at Meijer. This reward is valid through July 31, 2014. You do not have to purchase everything at once. Meijer has over 100 school supplies items on PriceDrop! Plus, you can still use coupons when they are available. This mperk can be found in the rewards section. Be sure to clip the mperk before you shop. Some mperks vary by user.